Able to make a omelette without egg. Here is the solution for vegetarians. But it can't taste like egg but its simple and easy way of doing omelette. You can prepare this within in 5 minutes and Gram Flour is good for Diabetic people. In a bowl mix all the ingredients by adding water little by little. Heat a tawa spread the mix as a thin round and sprinkle some oil to cook. On top of that you can add any veggies. I added tomato and chopped coriander leaves. 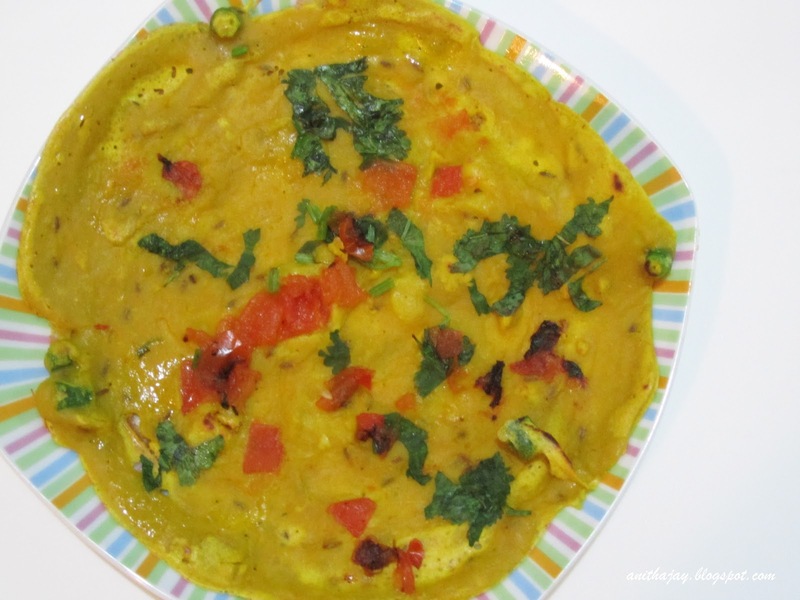 Cook on both the sides and enjoy the vegetarian omelette. Looks colorful n inviting...glad to be first follower :) hope to see more yummy recipes from u, pizza with wheat base is sure a healthy n yummy one, do try it sometime n let me know h it turned out to u!! Take care of ur health!! Yumm.. Nice replacement for egg.